For years, farmers in Thailand have been resisting pressure from the United States and Europe to adopt strong intellectual property laws on seeds. In the wake of Thailand joining the WTO, the country passed a PVP Act in 1999. The Act was a partial solution to avoid succumbing to stricter laws, such as UPOV, which would severely threaten Thailand’s 25 million peasant farmers. Although less restrictive than UPOV, the 1999 law already places some restrictions on what farmers can do with varieties protected by a PVP certificate. Farmers are allowed to re-use protected seeds, but there are many requirements: they must have purchased the original seeds themselves; they can only re-sow them on their own farm, meaning the seeds cannot be shared or exchanged; and in some cases there are also quantity restrictions. In the context of negotiating free trade agreements (FTA) with Thailand, the US and Europe have been putting pressure on the country to provide stronger property rights and revenue streams for the seed industry. Through the US FTA, the seed industry wanted Thailand to adopt UPOV ‘91 and allow full fledge industrial patents on plants. In response to this, Thai farmers and other social movements built strong coalitions that successfully disrupted the FTA process. In 2006, 10,000 farmers and their allies faced the police and besieged the seat of the US-Thailand FTA negotiations, which since that moment collapsed. 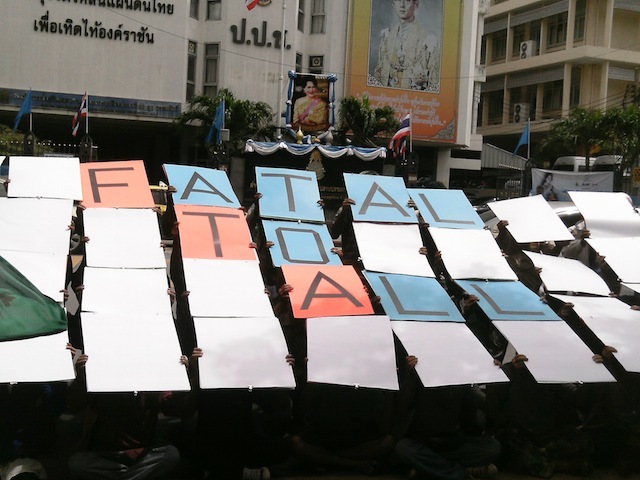 In 2013, thousands more marched in the streets of Chiang Mai where FTA talks with the European Union were being held. According to leaked drafts, Brussels was demanding that Thailand implement UPOV ‘91 which the farmers staunchly contested. The EU-Thai FTA talks have since been put on hold, but now talks with the European Free Trade Association are to be finalised soon. The vigilance of the farmers therefore remains strong. Project Details There are two main types of ‘intellectual property’ systems for seeds: patents and Plant Variety Protection (PVP). The US started allowing patents on plants in the 1930s, when flower breeders demanded a kind of copyright on their “creations” - they wanted to stop others from “stealing” and making money from their flowers. Plant patents are very strong rights: no one can produce, reproduce, exchange, sell or even use the patented plant without the owners’ authorisation. To use a patented seed variety, farmers must make a payment to the owner of the patent. Farmers who buy patented seeds are also obliged to agree to a set of conditions: that they will not re-use seed from their harvest for the following season, that they will not experiment with the seeds, sell them or give them to anyone else. Monsanto Company even asks farmers to spy on their neighbours and report anyone doing these things with ‘Monsanto seeds’ to the police. Today, patenting is standard for GMOs. Plant Variety Protection is a kind of patent developed in Europe specifically for plant breeders. It has slightly different criteria and gives less extreme powers. In 1961, European states created the Union for the Protection of New Plant Varieties (UPOV) which harmonises rules on this through the UPOV Convention, which has been revised several times. In the early decades, UPOV gave breeders the right to prevent others from producing and using their varieties, but farmers were still free to save and re-sow seeds from protection varieties. Other breeders were also allowed to use protected materials in breeding programmes. However, with the 1991 revision of the UPOV treaty, plant variety protection became much more restrictive, Under UPOV 91, farmers are no longer allowed to re-use seeds of protected varieties except in rare cases. And when it is allowed, farmers still have to pay a royalty to the seed company to user their own farm-saved seeds. Thailand passed the PVP act on November 26, 1999 (1). If Thailand ratifies UPOV 1991, the period of protection of new plant breeds would further change from 12 to 25 years (2). "1. It will withdraw the rights of the farmers to keep, conserve and exchange genetic materials of plants, which are natural rights of small-scale farmers, recognized in article 66 of the Thai Constitution 2007. 2. It will destroy the mechanisms for access and benefit sharing under the Plant Varieties Protection Act, 1999 which is a law conducted on the basis of the Convention on Biological Diversity. The amendment of Thai laws to make them consistent with UPOV 1991 would be seriously detrimental to the effective protection of our local plant varieties and would indirectly support biopiracy. 4. From the studies in Thailand, it has been found that the small-scale farmers would face increased costs in buying seeds of 2-6 times higher than the present." Network of fish folks,Phang-nga Bay. Why? Explain briefly. The final outcome is not yet clear.